FILE - A sign giving directions is seen in the parking lot of the United States-Canada border in Surrey, British Columbia, Feb. 16, 2017. Detention of Mexican citizens in Canada has spiked since December, when the government lifted its visa requirement for visitors from Mexico, figures obtained by Reuters show, even as Canada burnishes its image as more welcoming than the United States. Detentions in the first five months of 2017 were more than twice the previous two years combined, according to Canada Border Services Agency statistics provided last week in response to a Reuters request. Canada's detention of Mexicans surged more than tenfold from 24 in November to 331 in April, the data show. The number of Mexicans filing refugee claims more than quadrupled from November to March. Canada's Prime Minister Justin Trudeau holds his G7 closing press conference, in Taormina, Italy, May 27, 2017. Prime Minister Justin Trudeau promised to lift the visa requirement, imposed by the previous government, during the 2015 election campaign in an effort to improve bilateral relations. Visitors from Mexico can now apply online for an electronic travel permit in a process that takes minutes. Mexican migrants have been looking to Canada as U.S. President Donald Trump's administration ramps up deportations and targets illegal immigrants who had been granted reprieves under the Obama administration. Trudeau's government has been under pressure from opposition politicians to reverse the visa lift, which a review late last year projected would cost about C$262 million. “The lifting of the visa requirement for Mexican citizens strengthens Canada-Mexico ties and builds momentum to expand trade, investment and tourism. 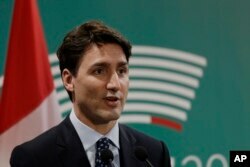 It will provide lasting benefits for both countries,” immigration department spokesman Remi Lariviere said in an email. The border agency can detain foreign nationals indefinitely on no charge if it believes they pose a danger to the public, if their identities are unclear or if they are deemed unlikely to appear for removal or for a proceeding. Toronto lawyer Ali Esnaashari, who has represented detained Mexican travelers, said in a telephone interview there was significant pressure on detainees to willingly leave instead of fighting to stay. 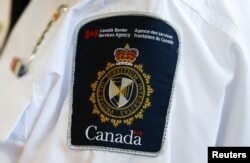 FILE - A Canada Border Services Agency logo is seen on a worker during a tour of the Infield Terminal at Toronto Pearson International Airport in Canada on Dec. 8, 2015. The number of Mexican citizens applying to extend temporary residence permits rose to 1,057 in March from 679 in November. The statistics track the number of detentions, not the number of detainees, which means if a person is detained on multiple occasions those will be counted separately.